Hi – this is Miles and this is the story of Besito Coffee – I’m being interviewed by Teena Hughes, and I’m very happy to be sharing our story on this page with you — how we got started, how we chose our name, how I came to be a Coffee Roaster, and much more. Enjoy the video! Teena: Miles, tell me how you got started with Besito Coffee? 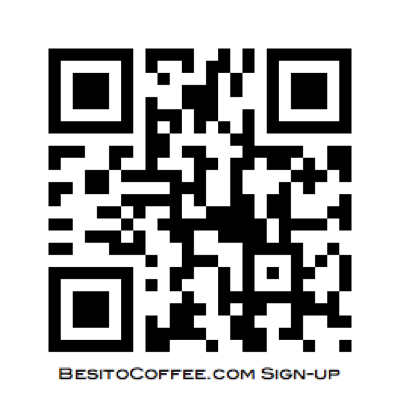 Miles: Besito started when I first discovered the beautiful Roaster (that I still roast on today) back in 2000. I proceeded to pull it apart — I never left a stone unturned, it needed a lot of restoring, and so I pulled it all apart for two things — one, to clean it and another to understand it. So through the process of pulling it apart and cleaning it up, it gave me great joy putting it back together — from new bearings, and belts and repainting all the panelling and getting everything rechromed and polished, so the glorious day when I got to roast my first batch of beans was quite exciting! I was in my garage (it was almost 14-15 years ago) . Teena: So that’s the roaster you still use today here in the coffee factory? Miles: It is, and that’s why Besito can owe a lot of its taste and profiling to the Roaster itself. I feel it’s very characteristic of the Roaster, the type of materials used when it was first manufactured, so like the spin speed, the casting, are part of the reason Besito tastes the way it does, and why I love it so much! Teena: And why I love it so much too! I love the coffee! Teena: That’s fantastic! Thank you very much.